Let’s start with the emergency visit to the supermarket. On the verge of sitting down after a long hard day at work to watch TV when all of a sudden the familiar sounds from the kitchen suddenly stop. The mixer falls silent, the opening and closing of the cupboards and fridge ensues and then abruptly ceases. A torrent of curse words follow. You know deep down what’s happened and what comes next. Then the call comes out “Phiiillllllll....I have ran out of....can you nip to the shop for me?” If you’re a true professional bakers husband you have put your shoes on before this, found your car keys and are just waiting for the name/quantity of missing ingredient before heading out in to the often cold night in search of eggs, flour or another random component. 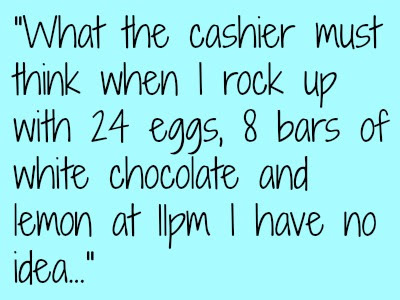 What the cashier must think when I rock up with 24 eggs, 8 bars of white chocolate and lemon at 11pm I have no idea. Then we have the “As you are near there could you just pick me up....” role. Here we might be in the area of a cake supply shop. This scenario normally involves buying a specific item. Sometimes it’s the easy; piping bags, cake boards etc. Other times it’s a much more specialised item like a certain colour ribbon (anyone know the difference between purple, Cadburys purple and deep purple? No, neither do I) It could be a piping nozzle or at worst sugarpaste which can also be known as fondant, roll out icing etc etc. I have spent more time on the phone to my wife in cake shops that at any other time in my life. Then there is the lone delivery. Driving with a cake in the car is hard enough, often worse when the cake maker is sitting next to you worrying about every bump, pot hole and person on the road. But when it comes to the ‘lone delivery’ the stress of actually meeting a client can be too much. Don’t get me wrong I like meeting people but the added pressure of handing over an edible item to someone I have never met, knowing my actions could impact on my partners business is stressful. The task that fills me with the most dread though has to be setting up a cake. Thankfully, it’s a task reserved for emergency situations only! I’m not a cake maker for a reason, well a whole bunch of reasons, but handling and setting up cakes is luckily a rare occurrence. Another element is the taste testing stage. This may be just me, but I’m a savoury kind of guy. I‘ve never really been into sweet thing but since the business was set up I’ve probably tested more sweet things than the average sugar addict at Christmas. Finally, a little knowledge is a dangerous thing. I know more about cakes than any non baker should. I know the names of bakers from around the country and I know all of my wife’s baking secrets. ... well not all, so no kidnapping me for ransom please. I have an opinion on cake controversies (non toxic glitter anyone?) and know all the subjects that can get other bakers mad (tell a baker how much you love the Tesco cake range, go on I dare you) Do I need any of this information; will it come up at my work or the next pub quiz? Probably not. To me the bakery world is an amazing place, so many people trying to do the different things with essentially the same basic ingredients and so many cake decorators staying up till 3am to get the perfect finish to their cake. I am in awe of it and the people that work in the industry. I am glad it’s not me doing it though, I’m happy to stay a baker’s husband. Underpaid and on a permanent sugar high. I know precisely what you are talking about. My girlfriend also makes a lot of cakes, I love her creations. But I despise the words of "Dazz, can you go to... to get me... please!? ", as I work in a supermarket and the last thing I wanna do when I get home is to go back there again of my own free(forced) will. I guess the staff discount helps tho. I'll never forget the night I had to go to our local 24hour Tesco's at some ungodly hour to get 18 bags of Icing/Caster sugar and various cake bits. So I plonk them onto the the belt and the cashier says to me "Oh... got a sweet tooth have we? ", "No not really, I just like to cover myself in icing sugar and pretend I am a ghost.... BOO!". It's also bad that I am now taking orders for my girlfriend and it scares me when people ask me stuff about cakes and I know the answer!! The next time your wife is baking and sends you out for stuff, just remember your not alone! I'll probably be doing the exact same thing, probably standing next to you in the queue. Thanks for the support. Next time I am in the baking isle, I will take a moment and stand back and take a look around. Safe in the knowledge that out there in another Tesco, in another city, some poor partner is going through the same thing. I'm with you - the long walks checking from one shop to another for cooking chocolate, cake boxes or something else to help fix a problem or make a creation complete. The strange looks at ASDA late at night, when buying 60 eggs like a maybe about to go on an egging spree. We are the unsung heroes of the wedding cake or novelty birthday cake - but getting those off cuts makes it all worth while ! I find eggs very stressful. Going through 5 dozen eggs ensuring no breakages or other contaminates. Piling them up like I have an egg OCD. We are heroes lets never forget that. Why do men not understand the sugarpaste/fondant thing? It must be the thing I use most and yet is the thing that causes the most confusion! When I ask for it, why oh why, does he perpetually come home with a box of powdered stuff. Even I don't know what that stuff is for, but thanks to my lovely husband, it is something I have boxes of, unused in my supply cupboard. I don't know you, but I haven't laughed so loudly for such an age! Thank you for posting this 'insight from the other side' I have just read it aloud to my husband who is often seconded for not dissimilar duties to yourself! Well I must say my husband is allergic to shops so wouldn't even go there... however he does think he is funny when he shows people around in the workshop and then pipes up with "yes and that is the one I made yesterday"... It does make me laugh as he can actually make sugar roses but wont go to the shops! Up until May this year, I was working as a Fire Chief out in Afghanistan (quite a Manly career I think you'll agree), and during my two year stint out there I was often asked my opinion on Skype as to the quality of "Sugar Paste Models"... or my personal favourite: "Am I charging too much for this 10 tier, fancy pants wedding cake which took over 600 hours to make, at £45.00??" "How the heck should I know... I'm in the middle of a war zone!!" Many a time I've woken up to an unopened email flashing away at me, from my other half... sent at 3am (UK time), with her having a complete breakdown because her Ganache won't go smooth!! Firstly... I'm a bloke... and a NON baker bloke at that, so my initial response is: "What the hell is Ganache?" ...and then upon being given the required information for me to make an informed suggestion, ask her if she's considered using a trowel!! Yes I know I said Trowel... but remember at the beginning, I did say I was a "BLOKE"!! Since being back in the UK permanently I have also become somewhat of an expert on the complexities of cake baking!! I never knew there was such an array of different types of sugars or flavourings... and the phrase which is most common in this household is: "Adiiii... can I use your eyes for a minute!" This phrase worried me slightly, in the early days... as I wondered if eyeballs was a secret ingredient she may be using, which I was unaware of!! However, now I know it only means, "Come and have a look and tell me what you think to this!" ...I'm even MORE afraid!! Telling a caker that the surface of the cake she's just iced, is slightly wonky... or that the leg on the Gymnast Model she is currently battling with, is slightly longer than the other leg... often leaves me fearing for my own life and yearning for the relative safety I experienced in downtown Kabul, Afghanistan!! My beautiful, petite other half... can change in the blinking of an eye, from the sweet lady she normally portrays, into a fire breathing foul mouthed daughter of Satan, when one of the petals on a floral decoration slightly cracks... or the expensive icing she's just bought, looks more like an old ladies cellulite once rolled!! It's about this time when I gather up the kids and herd them out of the house to cries of: "Why has Mummy's face turned Red, and what are those words she's using??" Having said all of the above... I (and no doubt every other Baker/Caker's Fiancee, Husband, Boyfriend, Partner), absolutely love to hear the, Ooooh's and Aaahhh's, and the "Oh my god, that's amazing!! ", when the intended recipient arrives to collect the object of The Boss's frustration from the previous week(s)!! LONG MAY IT CONTINUE... AND WHERE DID I PUT MY GYM MEMBERSHIP CARD! !